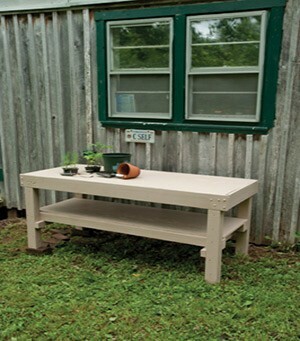 Quaint and old fashion-looking, this distinctive potting bench will be sure to blend right in with your cottage-style home (that is, if you live in one). With wood trimmings that are a bit unshaven, along with some wood shavings left from the time that you had designed the bench, this cottage-styled potting bench will be sure to give you satisfaction from storing your potted flowers and tools, giving it that rustic feel to it. Made from plain pallet wood, this type of potting station is simple while also being extremely useful for storing just about anything on there. It does not necessarily need to store potted flowers or plants, but also it can be used to store work tools, cups, and even vases to add that extra charm to the whole area. If you find that your pallet potting station is looking a bit drab, then sprucing it up with some bright colors and patterns cannot hurt. From a periwinkle blue to a sharp, zebra-striped motif, the possibilities for decorating your pallet potting station are endless. A coveted item, redwood is especially an interesting, but also wonderful item to choose from in order to design and construct a potting bench with the authenticity and earthiness of the actual wooden piece itself. It is also very sturdy and durable, able to take a beating every once in a while, and it is not afraid to get a bit dirty should a large storm roll by outside in the garden. 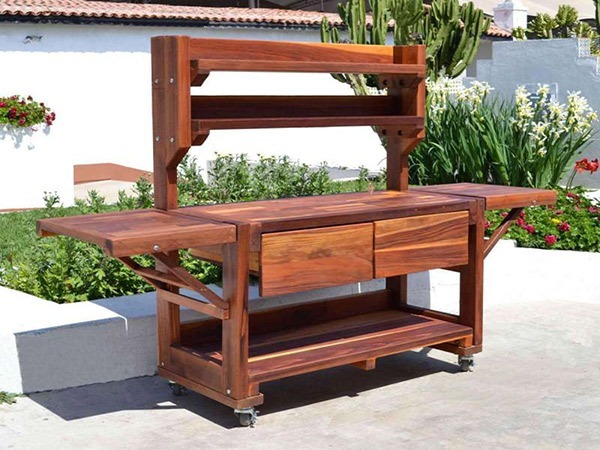 Overall, redwood potting benches offer a naturally aesthetic experience to your gardening experience, and it is not a bad idea to take full advantage of that! 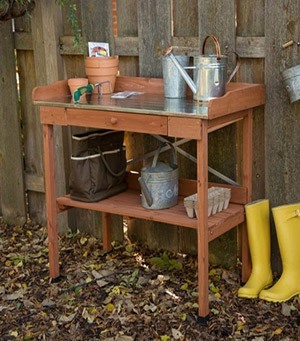 As the name suggests, a three-level potting bench comes in three separate tiers for storing just about anything gardening-related in it. Having three levels creates a better-organized storage space, so that you can find the necessary items that you need for your next big gardening project quickly and efficiently. For instance, on the top, open level, you can put your potted flowers, plants, and crops for a beautiful display, as well as a few vases with flowers already in full bloom for some elegance. On the middle tier, perhaps you can store budding flowers and plants that are not quite ready to be shown outside. As for the bottom shelf, you can store your necessary tools and other gardening equipment, for they will be more inconspicuous to the eye. Made from three different types of wood, the tri-wood potting bench offers variety to the bench itself, as means of promoting diversity within the garden setting. At the same time, it also has a distinctive H shape design to it, which can be interesting to look at while also serving as a practical layout for storing many different things for your backyard. Not only that, but provides a real, raw aesthetic to your garden. 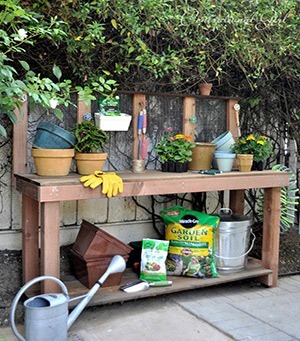 If you do not have a lot of potted plants or flowers to begin with, then a short potting bench is the way to go. 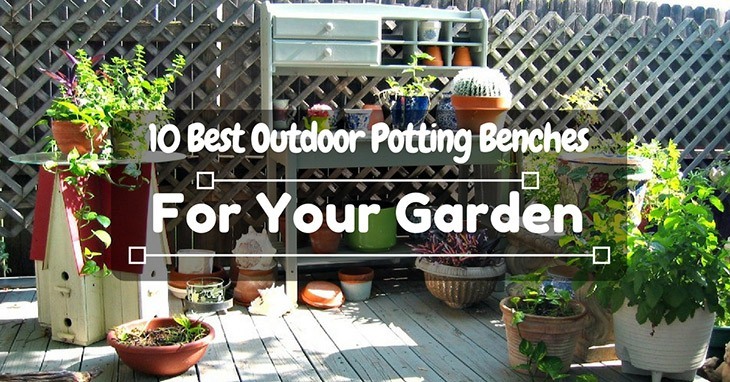 Low-raised and minimal in design and shape, it can be as simple as a single-tier bench to put a couple of pots in the corner of your backyard garden, which might otherwise be hidden, but in any case adds to the charm of the outdoor home. Even better, it is not too difficult to design and build, since it is such a simple, mono-level structure. 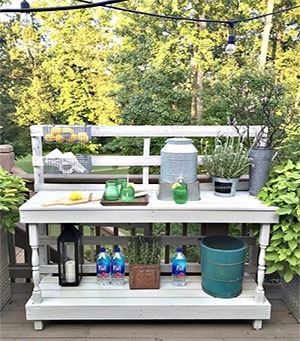 Similar to the cottage-style potting bench, the farmhouse-style potting station is also just as rustic and quaint, as well as being more in touch with its country roots. Even more so, it can be quite elaborate, with different features and accessories that add a bit more pizzazz to the overall product itself. From metal side hooks to top-shelf tiers, there is a wide range of possibilities to inspire you with this particular potting station. Even further, you might want to decorate it up with some bold colors, such as red and white, as means of giving it that barnyard kind of feel to it. Of course, it is completely optional, but especially if you are a designer, then why not give it a try? For a fresh and breezy potting bench style, try out the Mediterranean. This special style of potting bench can bring back memories of being in California, or even along the southern coast of the Mediterranean Sea during your honeymoon. 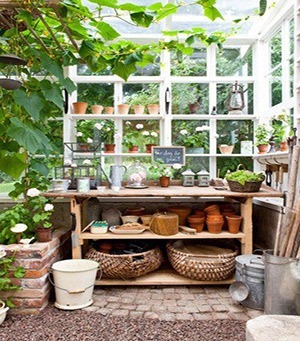 That said, having this distinctive potting bench can be a great way to remember those great memories, as well as keep your garden looking just a bit brighter and more organized for that lovely harvesting moment. 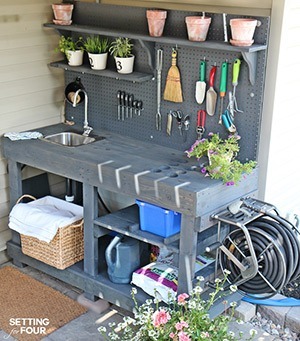 What makes this particular potting station different from others is that it is made from a door! If your current door, whether it is that of the front of the house or your backyard toolshed, is starting to fall apart, then why not consider taking it off its hinges and putting it to good use, instead of throwing it away? After all, it will save you the time and effort of having to demolish it, and as a result, you are being economical! 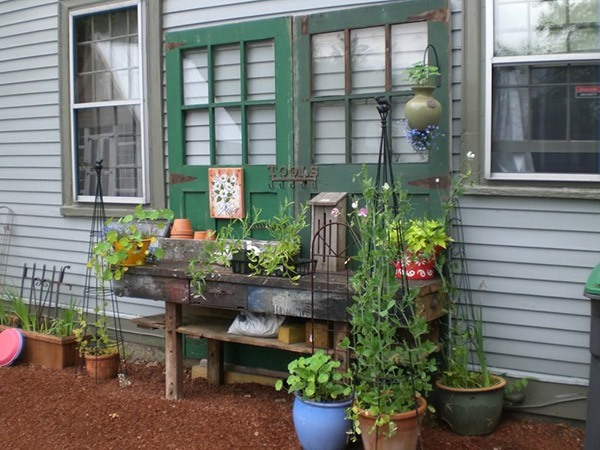 By keeping the door knob and merely adding other wooden parts to the project, you will create a lovely and original potting station that can add an extra something to your garden. Soon enough, family and friends might ask you about such an ingenious gardening item! This one does not specifically refer to any sort of wood or design, but rather a concept that can be interpreted in many different ways. For instance, you can choose to go with an ornate, mahogany motif or perhaps a more austere, Victorian-style design. The word “antique” can mean so many different things that there simply is not one way to go about it. Hence, it is up to you to decide just how to interpret this potting station idea, and more likely than not, it will yield original results! 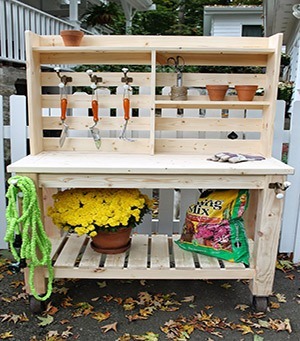 All in all, there is a huge variety of potting bench and station ideas to get you inspired for your next gardening project. Not only that, but they are super useful for storing and otherwise saving space in the garden, all the while being aesthetically-pleasing to look at. 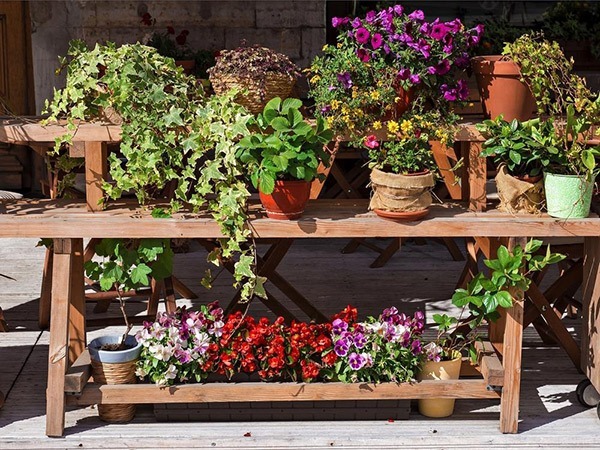 Whether you choose to build your own potting bench or station, or just purchase it from your local hardware store, it will help enhance your garden to look even better than it did without it.